Alciato at Glasgow: Emblem: EX DAMNO ALTERIUS, ALterius utilitas. Gloria victoris, praeda futura sua est. While a lioness, vicious in claw, and a boar, fearsome for its tusks, were setting upon each other, inflicting mutual wounds with their savage weapons, a vulture hurried up to watch, lurking in expectation of a meal. The victor’s glory will belong to the one that gets the spoil. 1. Cf. 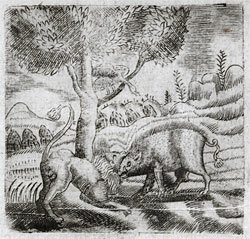 Aesop 200 and 203. To view the commentary for this emblem, press the link to the facsimile image of this page above, and thereafter use the 'Next facsimile' and 'Previous facsimile' links to navigate through the commentary. Hint: You can turn translations and name underlining on or off using the preferences page.